We are pleased to announce our relocation plans. The office of Richard A. Grant DDS will soon be located less than five minutes away (10 minutes driving) from our present location. 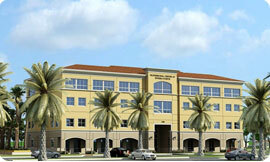 The new office will be at the Professional Center at Riviera pointe, situated at the NE corner of County Line Rd. and University Dr. Behind the Advanced Auto Parts store. This move will allow us to better serve YOU. Our facility will hold the latest technologies to assist in diagnosis, treatment, and patient care. Hopefully you will like the windows in each operatory! Naturally, we will be sharing further communications as we approach the move date, so please stay tuned. We thank you for choosing our office and the in help us grow over the years. Please contact our office manager, Natalie Charles at 305-652-3001 or ncharles@drrichardgrant.com, should you have any questions.